We were discussing Otto cycle, an ideal cycle for internal combustion spark ignition reciprocating engines or simply petrol engines and also Diesel cycle, the ideal cycle for the operation of internal combustion compression ignition reciprocating engines in our previous posts. 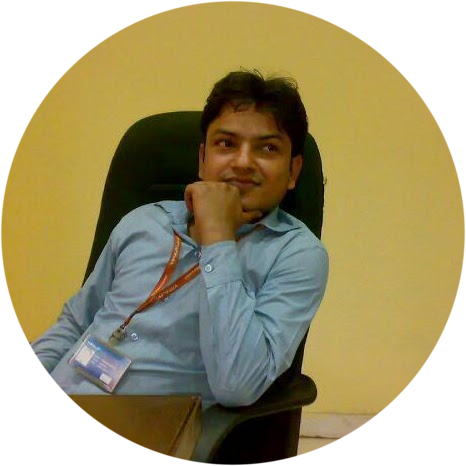 We have also discussed the derivation of efficiency of Otto cycle and efficiency of Diesel cycle. We will see here the very important topic i.e. Open cycle gas turbine power plant or open cycle gas turbine engine with the help of this post. Open cycle gas turbine engines are usually used in aircraft engines, marine engines and also in automobile engines. Compressor, Turbine and combustion chamber are main components of an open cycle gas turbine engine. 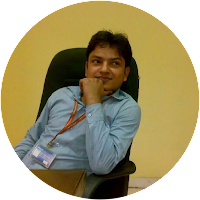 Let us see the arrangements of various components of an open cycle gas turbine engine. Fresh air will enter in to the compressor at atmospheric pressure and temperature, where pressure and temperature of air will be increased. 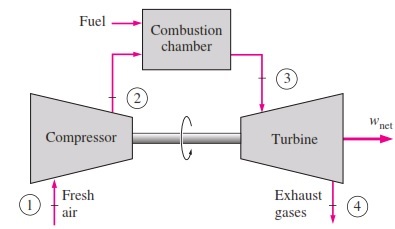 Now air at high pressure and high temperature will enter to the combustion chamber as shown in above figure. Fuel will be injected from outside in to the combustion chamber and therefore burning of fuel will take place within the combustion chamber in presence of high pressure and high temperature air. Hence combustion product i.e. gas will have high pressure and high temperature at the discharge of the combustion chamber. High pressure and high temperature gas will enter in to the turbine, where high pressure and high temperature gas will be expanded through the turbine. Pressure and temperature of the gas, both will be dropped here. There will be drop in temperature of gas but still temperature of gas will be high, while pressure of gas will be reduced to atmospheric pressure and hence we can say that high temperature gas will be rejected to the atmosphere at atmospheric pressure. As we can observe here that fresh air is entering in to the compressor at atmospheric pressure and temperature and high temperature gas is rejected here to the atmosphere at atmospheric pressure and exhaust gases leaving the turbine are not re-circulated but also going to the atmosphere therefore this cycle will be termed as open cycle gas turbine engine. Work energy will be generated from the turbine during the expansion of high pressure and high temperature gas and some part of this generated work will be used to drive the compressor and hence compressor and turbine are assembled with common shaft as shown in above figure. Process 1-2: Isentropic compression process, fresh air entering in to the compressor at atmospheric pressure and temperature will be compressed here at high pressure and high temperature. Process 3-4: Isentropic expansion process, high pressure and high temperature gas will be expanded through the turbine. We will see another topic in our next post in the category of thermal engineering.